Dear Readers, I have yet another brand-new series to review. 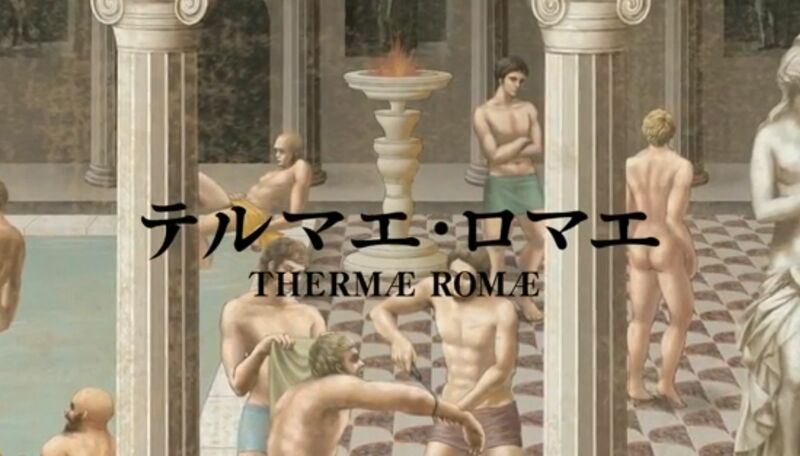 This one Thermae Romae is currently running on Fuji TV. This anime series is based on an award-winning manga series of the same name by Mari Yawazazi. 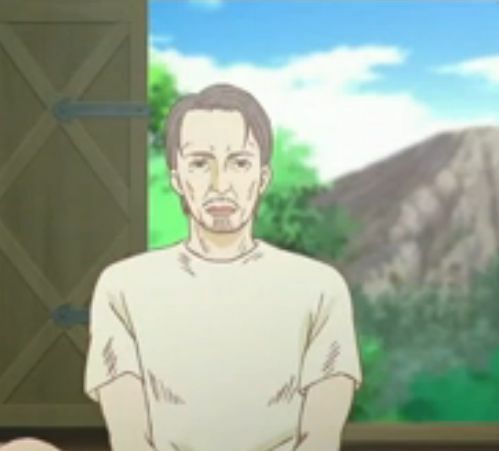 The manga series itself was popular enough to spawn a live-action feature-length film (scheduled for release this year), and this anime series. 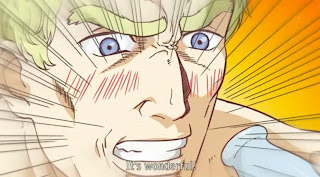 After viewing the first three episodes of the anime, and watching the trailer for the live action film (embedded below for your amusement/bafflement) I have to say...um, uh...what just happened? 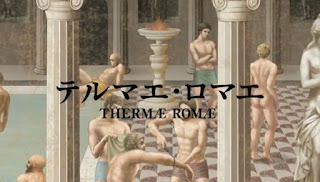 Well, Thermae Romae just happened, I guess. of Roman Art and Architecture. The central figure of Thermae Romae is Lucius Modestus, a Roman architect living during the rule of Hadrian. He seems to be suffering from architect's block. Frustrated by his lack of inspiration he seeks relaxation and recharging at one of Rome's many baths, only to find them anything but relaxing. Whilst (yes, "whilst") dunking his head under the water for a little peace and quiet, he notices a strange drain in the floor of the caladrium and is immediately sucked down the drain (yes, "down the drain") only to emerge in Modern Japan. This is the plot. Now far be it for me to pooh-pooh a time-travel adventure, because honestly, I love me some wibbly-wobbly, timey-whimey time travelling. But, still being honest, this is a weird anime. Even if we ignore the absurdity of the plot (yes, that is the plot...architect sucked through time drain), this is still pretty silly. It is also the kind of silliness that I know Japanese audiences enjoy, a "fish-out-of-water" comedy. The old man is right. Lucius doesn't understand Japanese. These kinds of comedies are nothing new to fans of anime or manga. We've seen similar plots and oddities in series like Magical Shopping Arcade Abenobashi (a favorite of Shakespeare's) and in Ramen Ikaga (a favorite of...man, I don't know who likes that one...silly CAN go too far). The thing is, I'm not positive that these types of comedies translate well. They just come off as punny and hyperactive, and many of the "jokes" are perhaps too culturally-specific to resonate with a foreign audience. In episode 1, Lucius emerges in what he believes is the "slave's bath" and is given a fruit milk to drink. He is a fan, to say the least. His response to fruit milk, which I think sounds gross, is pretty dramatic. The fruit milk stuns him into unconsciousness, and he awakens again in Ancient Rome (which to him is just Regular-old Rome) inspired to take what he's learned on his time-travels and introduce them to his own culture. Fruit milk is such a hit with bath patrons that he has to buy another cow. The end. Episode 2 begins one year after Lucius's new "avante-guarde" (the anime's words, not mine) bath became a hit. He is called to the bedside of Consul Lepidus...and OH, MY GOD, IS THAT STEVE BUSCEMI? No, I guess it isn't, but would it really be that weird? 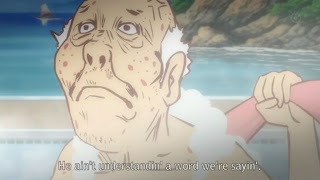 I mean this is an anime where monkey attacks at hot springs seem unsurprising (that comes in a minute, Dear Readers). Anyway, he is called to the Consul's deathbed and is asked to construct an open-air bath, something unheard of in Roman times (I did not know that, I learned something! This is educational!). While searching the grounds with Steve Buscemi look-alike, Regulus, he discovers a natural spring that's heated with the waters of Vesuvius. He enters the spring and SHAZBOT, he's whisked back to modern Japan, and is attacked by monkeys (I always deliver on my promises, Dear Readers). Lucius fell into the monkey bath, instead of the people bath. Now he's going to need Rabies shots. I hope he gets them while he's still in the "future." Aside from discovering the benefits of hot springs, Lucius also discovers hot-spring boiled eggs and warm sake. He relaxes into a slumber and awakens again in Rome. Inspired he builds the bath which not only restores the Consul's health, but renews his vigor entirely. Hooray! Also, somehow a monkey got sucked back into Rome with Lucius, but no one seems to worry about that. Episode 3 begins two years after the first accidental time tubing, with a history lesson about Hadrian and his homosexual lover Antinous and a description of a strigil (a Roman bathing tool that looked a little like a shoehorn and was used for scraping oil and dirt from the body). See, we are learning stuff. Lucius is having a discussion with his friend about creating baths in the home when...SHAKAZULU, he's whisked again back to modern Japan. 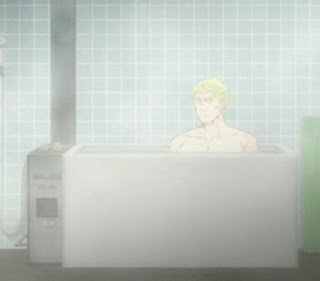 This time he emerges in a soaking tub in a regular Japanese home. He is mistaken for a caretaker by a very old man who introduces him to amazing things like washrags and beer. Again, he passes out, this time awakening with a washcloth in his hand and a plan for a home bath and shower for his friend's aging master. And use it he does! And I stopped watching here. Cow Bowels. 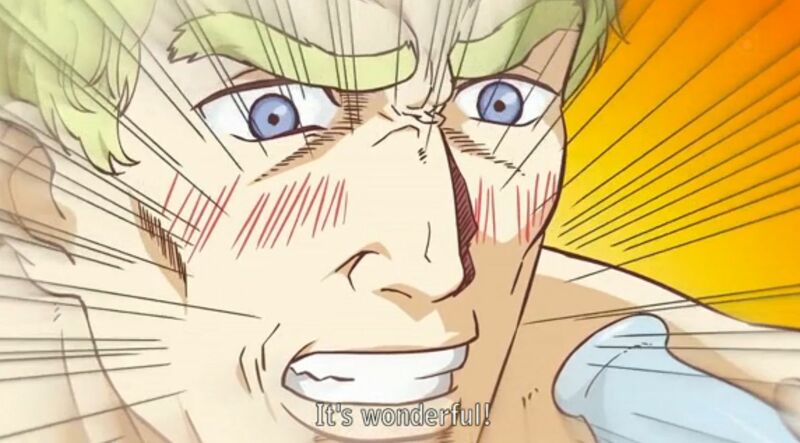 All in all, Thermae Romae isn't SO-Bad. It is a little funny. The episodes are short, even by Japanese norms--they run around 12 minutes each, and the artwork is different enough from the standard fare to be interesting. It is weird though. Purposefully weird. And I'm not exactly clear what's special or compelling enough about this series that it deserved a live-action version...then again, I'm not sure why people watch Adam Sandler movies either. So, take my impressions of this series with a grain of salt and a full-awareness that this isn't something I'd be super into no matter what form it took. It is a fun bit of fluff, but not much more. Now here's that live-action trailer I promised you, enjoy! Oh My God, this sounds delightful. I actually do think you'd like it. It's pretty funny stuff. And the Steve Buscemi cameo is priceless...I mean that HAS to be Steve Buscemi, right? One of my favorite parts of this is the interaction between Lucius (who IS speaking Japanese but is supposed to be speaking Latin) and what he calls "flat-faced slaves" (Dear god! NO! WHY?! )...it's hard to believe there is a communication problem when both parties are technically speaking Japanese, but claiming they do not understand one another. It's madness, I tell you! MADNESS!